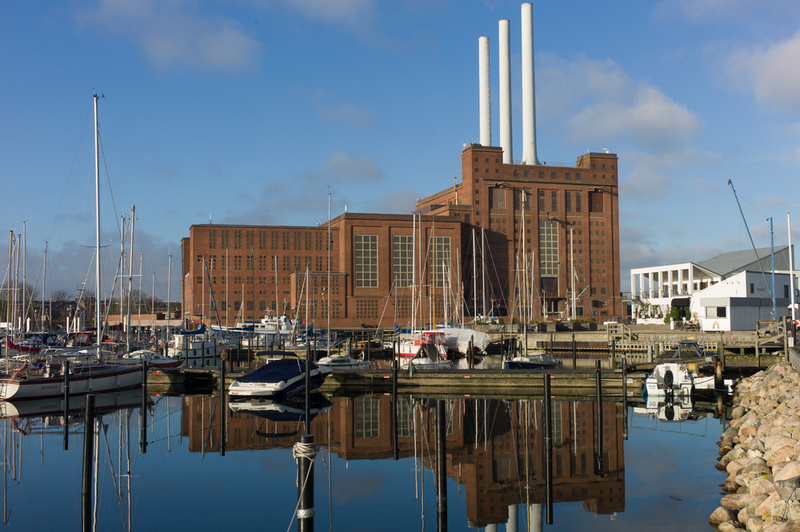 Over the last fifteen to twenty years there have been major schemes for new building and redevelopment of the commercial wharves and industrial buildings of the harbours in Copenhagen, Malmö and Oslo. In all three cities there were large areas of docks for commercial shipping, container transport and ferries close to or adjoining the historic centres of these cities but as commercial shipping and ship building has either declined or has been reorganised and relocated in response to extensive economic changes then this land has become available for other use. Generally these cities are developing the land now available for new housing, usually large apartment buildings, but with commercial office buildings and of course leisure and recreation and retail space. It seemed to me to be interesting to look briefly at all three cities to see how they are approaching the architectural challenge and to see if the new buildings in these areas reflect an unrelenting 'international' style or if the new buildings reflect the different character and different needs of the three cities. 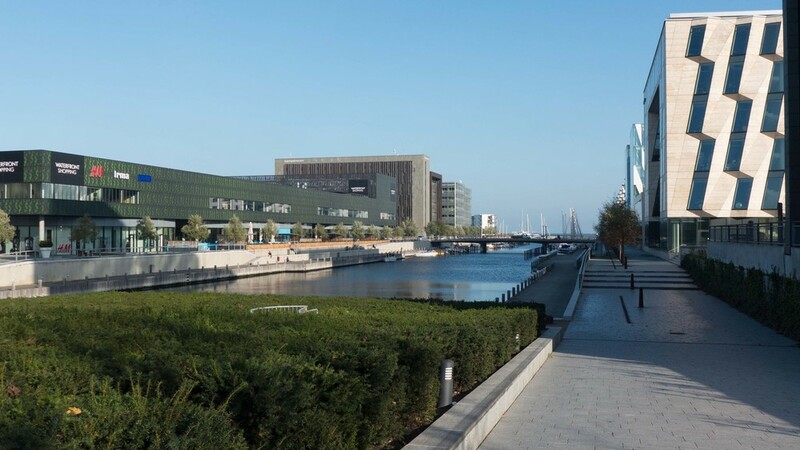 In Copenhagen over the last twenty years there has been extensive development of the inner harbour and the south harbour, at Teglholmen and Sluseholmen, and huge areas of new building south of the city in Islands Brygge and Ørestad but in this post my focus is on the development of Nordhavn or the North Harbour. Last week I took a train up to Hellerup, north of the city and walked back to Kastellet, the 17th-century fortifications on the north edge of the historic centre, to look at the harbour areas and to take photographs. It was only having done that walk that I can even begin to comprehend the enormous scale of this redevelopment … maps alone do not really give an idea of the distances and the area of land that is being redeveloped. Really there are three distinct parts with the most established area immediately north of the historic centre, the area of the old Free Port north of the fortifications of Kastellet, around Amerika Kaj and India Kaj. Old dock buildings, mostly in red brick and dating from around 1900 have been retained but with new office buildings on the quays and a densely built up area of residential buildings between the dock and the railway but even here there are many new buildings under construction or schemes where work is about to start. This area includes the terminal for the ferries to Oslo. Beyond is the north harbour area proper with an imposing power station, Svanemølleværket built in 1953, on the west side between the harbour and the main railway line to the north. This area is all land fill and in fact is still being extended out into the sea, taking much of the earth and gravel that is being extracted for the new tunnels of the extension of the metro in Copenhagen. The new buildings here, barely started, will eventually cover eleven islands and house 40,000 people. There is also a major new terminal for large cruise ships at Ocean Kaj. Detail of the map of 1888, immediately before work started on the Free Port, and an air view taken from google maps. The key points of reference are the Kastellet, bottom left, and the old triangular fort guarding the harbour entrance. The new terminals for cruise ships are along the long quay set at an angle top right. Further north again, up the coast and beyond the distinctive three chimneys of the power station and beyond a marina for boats and yachts, is the site of the Tuborg brewery that closed in 1996. Recent buildings here are again well established with a shopping centre, some amazing office buildings on the quay and expensive apartment blocks set to look across the Ørseund or to look back towards the North Harbour across a broad seashore park. The construction of the Free Port began in 1891 and the wharves and docks opened in 1894. The development was a direct response to counter the opening of the Kiel Canal in 1895: work started on the canal in 1887 and allowed shipping to move between the Baltic and the North Sea avoiding Copenhagen and its port. On this early plan of the Free Port it is orientated with North to the left. The edge of the fortification of Kastellet is shown on the right. The Free Port was immediately north of the city fortifications at Kastellet and was laid out by Holger Christian Valdemar Møller with two docks running north south and open to the sea at the north end. The west quay or Amerika Kaj, now the site of Amerika Plads, had the main railway lines serving the port along the west side and included a power station. Across the south side, close to Kastellet, are administration buildings from about 1900, of high quality architecturally, mostly in brick and most have been retained with the redevelopment. There is a central quay, Midtermolen, and an outer quay, the Langelinie Kajen with substantial harbour buildings along its length and on the outer or sea side a raised promenade above low single-storey warehouses that have been kept. The long seaward quay, Langeliniekajen (Langelinie Pier), is now a major terminal for cruise ships. Substantial key buildings, part of the original construction, were by Vilhelm Dahlerup including the Silo Warehouse of 1892-94 (demolished after a fire in 1969) the Warehouse 1 from 1893-94 on the east side on Langelinie Kajen and the Manufakturhuset about 1900 on the west America Plads side. A second Silo Warehouse, Warehouse B by Fredrik Levi from 1903 with its distinct end towers, also survives on the Amerika Plads side. The area around Amerika Plads is now densely built up and has an urban inner-city character with mainly apartment buildings flanking a main street running north south and around a narrow public courtyards to its west. Original port buildings here include a large warehouse block, the Silo, a power station and a rebuilt railway station. 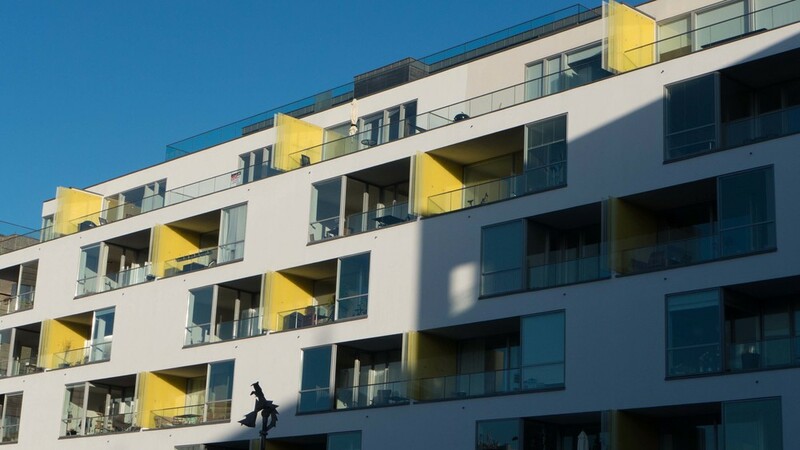 The new apartments include Nordlyset (Northern Light) by C F Møller from 2006 enclosing a courtyard with sharp clean white facades and distinct yellow shutters. 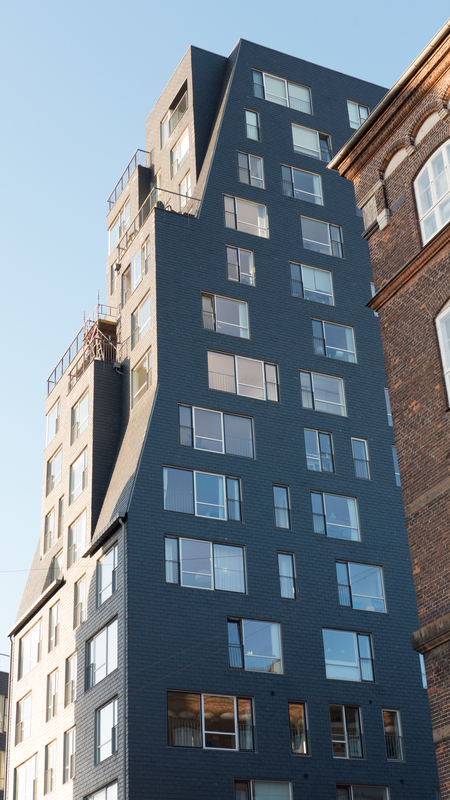 There is a large brick and framework apartment block by 3XN, the Kobbertårnet (Copper Tower) from 2004 by Arkitema and at the south end the Fytårnet (Lighthouse) by Lundgaard & Tranberg Architects with its dark grey tile cladding and begun in 2006. Midtermolen (the central quay) is the least successful visually and already looks rather dated. 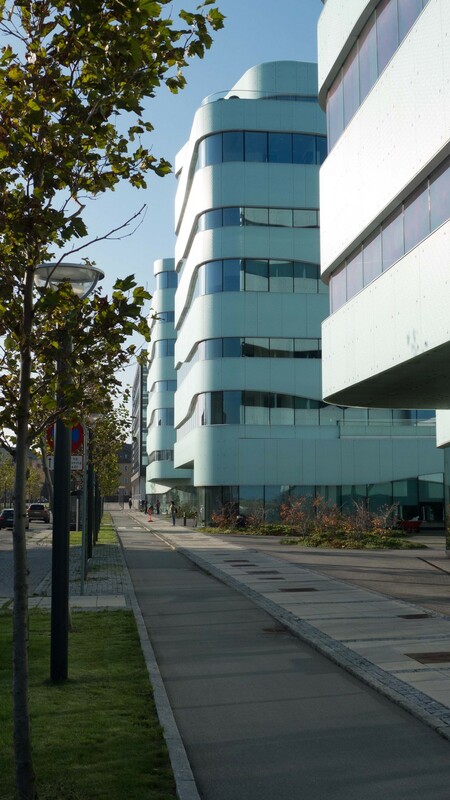 A development from 1994 by PLH Arkitekter replaced the Dahlerup building destroyed by fire but although its great arc of blue glass on its east side is dramatic, it is rather mechanical and the original Dahlerup building provided a much stronger sense of form and drama at the centre of the port. There are three large office buildings, the most northerly with the high semi-circular block, on the west side of the quay and a line of apartment buildings in pale brick on the east side of the quay. The Langeliniekajen (the outer or east pier) is without doubt the grandest and most formal part of the new harbour development. There are seven buildings in line running north south and looking west onto the east harbour and east over the promenade to the cruise ship quay and the open sea. At the centre is the impressive warehouse by Dahlerup from 1900 and this determines the scale of the other buildings - specifically the depth and height of the buildings. At the city end are apartment buildings by Schmidt, Hammer & Lassen from 1997 and north, beyond the 19th-century warehouse are the Finance Institute for Danish Industry from 2002 by 3XNielsen with extensive white shutters articulating the facing brick of the facades and, at the north end, an office building in hard dark red brick for ATP by Lundgaard & Tranberg Architects and just nearing completion. These buildings pick up the form and scale of earlier warehouses on the inner harbour in an appropriate and sensitive way ... if it is possible to use the word sensitive for buildings of this baulk. It gives not only a sense of continuity and a sense of rhythm to the harbour front but it reflects the source of the wealth and importance of the city that came ostensibly from its sea trade and sea power. This is a slightly surreal area and to say that it is work in progress is an understatement. The earliest major building actually dates back to 1987 and is the Paustian Furniture Building by Kim Utzon on the north edge of the development but generally the area is covered with factories and storage yards. It is also an area of major infill taking much of the earth being excavated for the new tunnels for the extension of the metro in Copenhagen. This landfill is not due to be completed until 2020 but by then there will be eleven islands and housing here for 40,000 people over the new land and an equal number of jobs in the area. Looking across to the North Harbour development area from the north end of the Langelinie pier. The UNICEF warehouse and the new terminal buildings for cruise ships can just be seen in the distance beyond the boat of the harbour pilot. Probably the largest and most important part of the development (in terms of the income it will generate for the city) is the new cruise ship terminal at Ocean Kaj that opened officially in May 2014. The quay is 1100 metres long with three terminal buildings with a zigzag roof profile designed by Christensen & Co.
800,000 passengers a year now arrive to visit or depart from or end their journey in Copenhagen. This outer quay is for the largest cruise ships and the ships that begin or end their cruise in Copenhagen. Some of these vessels can arrive with 4,000 passengers. The quay has major facilities for loading fresh water, handling baggage, dealing with the restocking of food and so on. The most important new building, now near to completion, is the U.N. building on Marmormolen at the south end of the new development area and was designed by 3XN. For security, the building will be surrounded by a moat and the entrance courtyard is approached over a corten-steel bridge with massive roll-up barriers to stop vehicles being driven at the building. The outline of the building is amazing ... not a solid block but made up of spiky narrow ranges, in a distorted star formation, that at their outer ends are almost infeasibly thin and pointed. If it has picked up the shape to reflect the geometry of the Trekoner (Triangular) Fort across the water then the architects have taken it to an extreme. 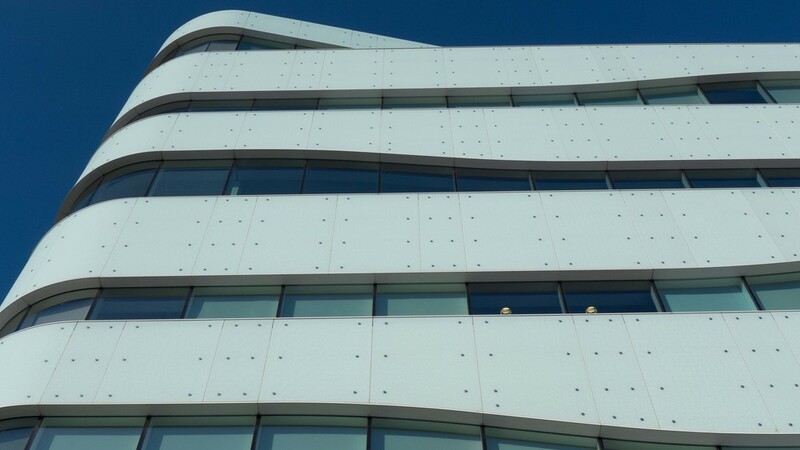 The building will be the home of seven U.N. organisations that are based in Denmark. Apartments by Vilhelm Lauritzen Architects nearby are well under way and are the first residential buildings in the area. The DFDS Ferry Terminal, again from 3XN, was completed in 2004 and is on a quay between Amerika Plads and Nordhavn. Before the completion of this terminal ferries had docked in the inner harbour on the quay immediately north of the State Theatre. The area of the old terminal is now the focus of a deceptively ambitious scheme to create a new water front space ... deceptive in that the surface of the old pier has been excavated to provide underground - below water-level - parking for 500 cars. This really is an important factor of the north harbour development that deserves comment. In many cities a change of focus on a new area inevitably means abandonment and blight in another area as major companies move across to the novel and more fashionable areas. In Copenhagen there seems to be a very positive attitude to renewal ... if one function or one major user moves on then that in itself should be seen as a major opportunity to reassess how the old site can be revitalised. Why is Copenhagen good at this? Well it's actually not a new approach. In fact far from it. In the early 17th century there were docks and shipbuilding across the whole area between Christiansborg and Nyhavn. As new ship yards on the reclaimed land on the opposite side of the harbour - Christianshavn - expanded, the land of the old dock yards was built over with expensive new apartments. Sound familiar. 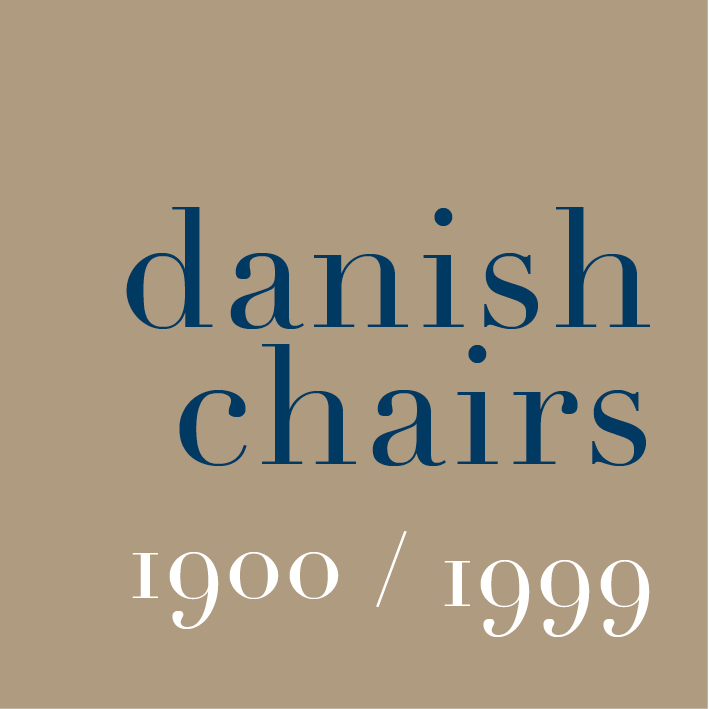 The city of Copenhagen has been doing dockland redevelopment for nearly four hundred years. They are getting pretty good at it. Perhaps the most amazing building that has been proposed for the Nordhavn development is the LM Project by American architect Steve Holl. This will form a high-level gateway linking across to the Langelinie Kajen under which the ferries will pass. The north harbour development covers a vast area with a complex overall plan with some older buildings that are to be retained but with a phenomenal number of new buildings by major Danish architectural firms and a number of international companies. There is a pamphlet published on line as a pdf about the development of Nordhavn that has good maps and images. 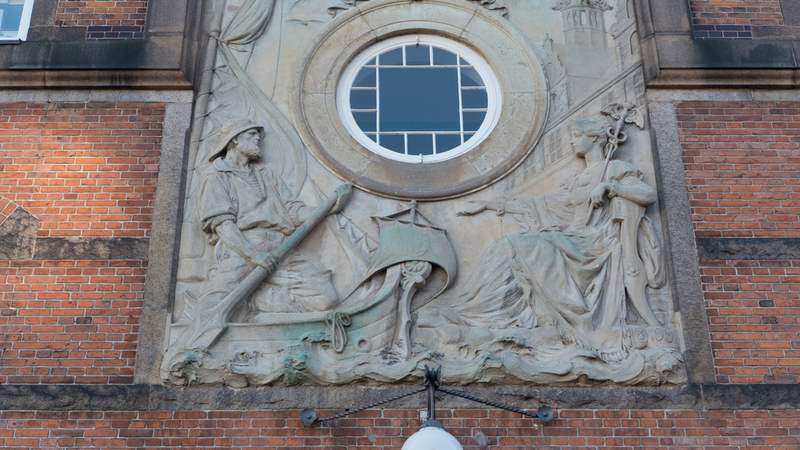 The Tuborg Brewery opened here in 1873 and the last beer was brewed on the site in 1996. 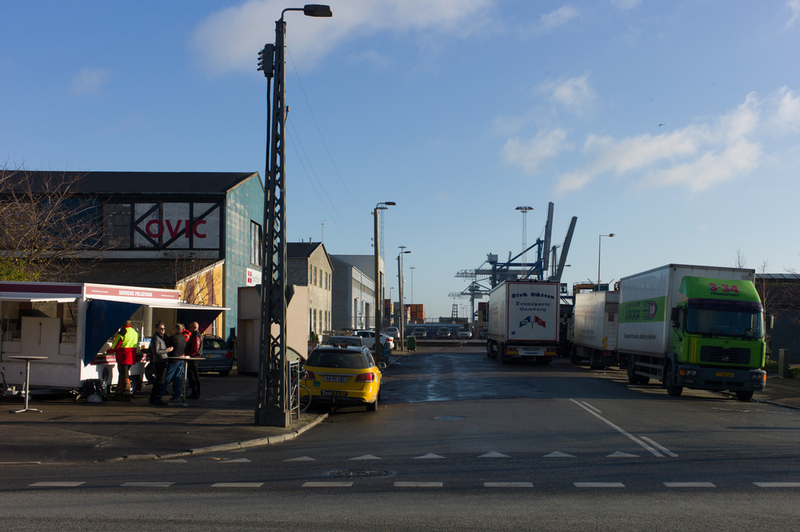 As in the harbour around America Kaj to the south, some buildings from around 1900 were retained in the redevelopment of the site but extensive new retail, commercial office and residential apartments have been built on either side of a dock that runs east west and is open at the east end to the Øresund. 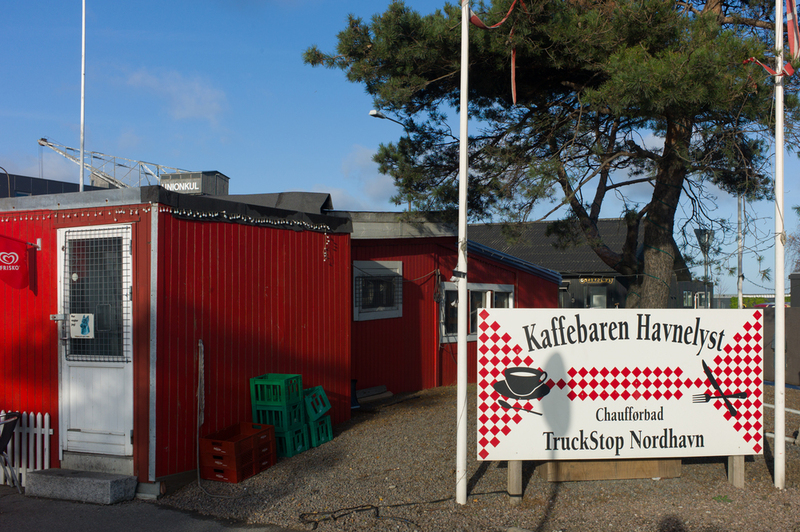 In fact this area, immediately south of the well-established suburb of Hellerup, is outside the boundary of the port of Copenhagen but the extent, style and high quality of the development and its distinctly urban style links it closely to the new works in the north harbour. The narrow area of marinas and smaller houses along the beach road between Nordhavn and the Tuborg site are already seeing some redevelopment so the two areas are being run together and Tuborg harbour really has to mark a north limit to the redevelopment of Copenhagen ... Hellerup has seen some major rebuilding on the east side of its high street but further development there is not likely and certainly no development would be allowed on this scale further north again in Charlottenlund. The key buildings around Tuborg harbour include the Waterfront shopping centre by Vilhelm Lauritzen of 2007 with its dark green facade but with a light and clean design for the interior with shop units along a gently-curving internal street. 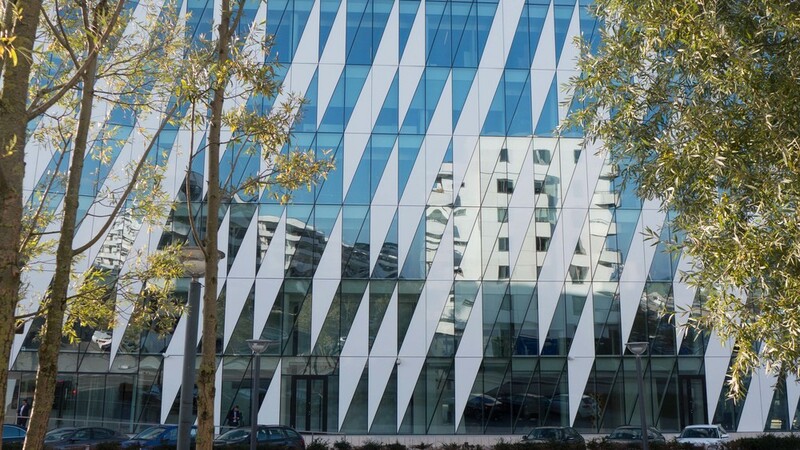 To its east is the office building for Sampension HQ of 2003 by 3XN with dark copper cladding and pierced shutters. On the south side of the harbour at the west or entrance end are a major group of office buildings including Horton Headquarters of 2009 by 3XN, Saxo Bank of 2008 also by 3XN and to their south a striking group of three blocks in a pale blue facing with undulating window outlines ... Punkhusene from 2009 by Vilhelm Lauritzen Architects - the designers of the shopping centre but here working in a very different style. To the east of these offices, on either side of Tuborg Havnepark, are a series of large apartment blocks by Dissing + Weitling completed in 2008. They take as a design reference point apartment buildings of the 1930s with white facades, curved balconies and rounded corners. The apartment blocks have views north onto the mooring or for the south blocks there are views over a large park and views to the North harbour and Copenhagen beyond. This is modern architecture at its best - the view down the main dock looking east is stunning in sunlight. The buildings vary in style but there is a restraint in the scale and proportions of the individual blocks and they are set out to create a rhythm for the group as a whole. 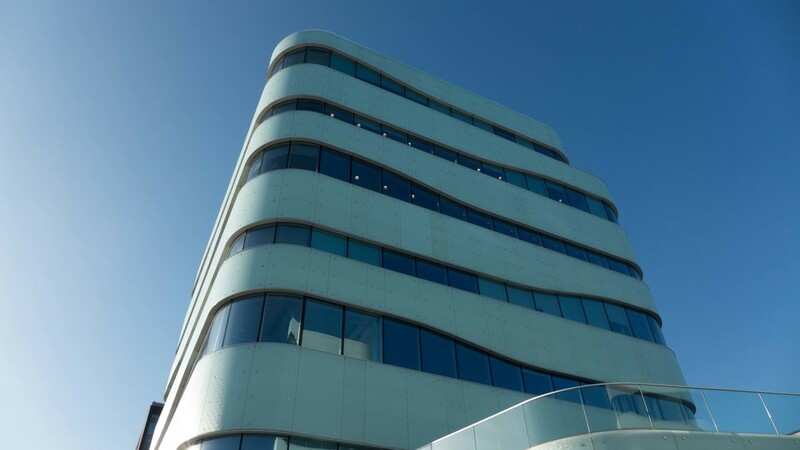 Above all the palette of blue, blue-green and white for the facing materials along with the variety and changes of angle in the glazing, catching and reflecting the light off the water, sets the highest possible standard for water-side developments.